Living life down on the [cube] farm. Did you ever want glasses or braces as a little kid? I can remember wanting them even though kids I knew that had them hated them… I kind of have had the same feelings about working in a cubical; I always wanted to even though friends of mine that had hated it. 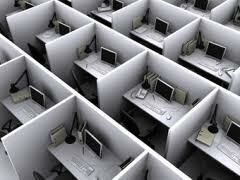 I wondered often how it would be to work in an open environment with cube mates. Would it be like Office Space? Maybe like Two for the Money-you know before Al Pacino moves Matthew McConaughey up. Well I finally had the opportunity to scope out this cube farm life… and just whoa. There are not a lot of cubicles where I am, but there are enough and because we are in a more open environment I have this daily anxiety that I’m disturbing everyone else. I’ve always been able to work/study in loud environments, but I don’t want to disturb others when they are working. My biggest challenge in this setting is not letting others distract me. When you are sitting in an open environment like this for some reason everyone wants to stop and chat. I’m so lucky to have the cubical that is by the entrance to the break room and the entrance into the plant. This means two things, everyone walks by me at some point in the day and if they are going into the plant they STOP and set ALL of their stuff on my desk while they put their hair net, beard net, hard hat, ear plugs, safety goggles and lab coat on. How do I cope with that? I put my ear buds in-even if I have no music going and focus on my computer screen, flash a smile and hope they keep moving. I have no personal items on my desk as I know they would never last with the constant storage my desk has to offer others. With this experience under my belt I cannot help but question who thought cube farms were a good idea? Where is such an environment the best setting for high productivity? Don’t get me wrong, I still get my work done, but some days it’s an extra challenge that I could do without. How do you stay focused on the cube farm? Author Kristina H. Minyard, SHRM-CP, PHRPosted on March 2, 2013 Categories UncategorizedTags Cube farm, Cubicles, Productivity1 Comment on Living life down on the [cube] farm.